The division of Heartland Bank offers Home Equity Loans. Heartland Seniors Finance has been accredited under Consumer NZ’s Consumer Trusted business programme. To become Consumer Trusted, a business must meet Consumer NZ’s strict code of conduct that focuses largely on consumer law such as the Fair Trading Act and Consumer Guarantees Act. A business must show it exceeds the minimum requirements of the law. Heartland Seniors Finance, a division of Heartland Bank, offers Home Equity Loans that allow seniors to borrow against the equity in their home without selling their property. 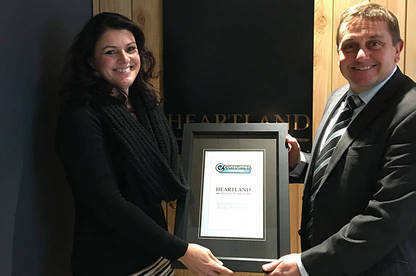 Heartland Seniors Finance national manager Lisa Hatfield and Consumer NZ general manager – business Derek Bonnar. Customers take out a loan against their home. The loan is only repayable, including interest, when the borrower sells the property or moves from the property permanently. Consumer NZ general manager – business Derek Bonnar said gaining Consumer Trusted status was a great achievement for Heartland Seniors Finance. “This type of financial product is not widely available in New Zealand. We assessed the Home Equity Loan carefully and were impressed with the commitment Heartland Seniors Finance had made to delivering an excellent customer experience and to ensure customers were kept well informed,” Mr Bonnar said. Heartland Seniors Finance requires borrowers obtain independent legal advice and strongly recommends they get independent financial advice to ensure they are well informed. It also guarantees continued ownership of the property, equity protection options and a 30-day cooling-off period. Heartland Seniors Finance was elated to receive Consumer Trusted accreditation. “We are passionate about our Home Equity Release product and we are proud to have achieved this endorsement,” Heartland Seniors Finance national manager Lisa Hatfield said. The Consumer Trusted programme has been running since 2014 and encourages businesses to deliver exceptional customer service. By using Consumer Trusted businesses, consumers can be confident they are dealing with market leaders that put the customer first. Consumer Trusted businesses are required to deliver over and above consumer law. Consumer NZ is an independent, not-for-profit organisation. Winners of Consumer NZ endorsements and awards can license use of the awards for marketing and promotions. All revenue raised from the endorsement programme goes back into the research Consumer NZ does to help New Zealanders get a fair deal. The Consumer Trusted accreditation programme recognises businesses delivering to the Consumer Trusted Code of Conduct. The Code ensures you can buy from a Consumer Trusted business safe in the knowledge they’re dealing with a market leader that puts the consumer first.